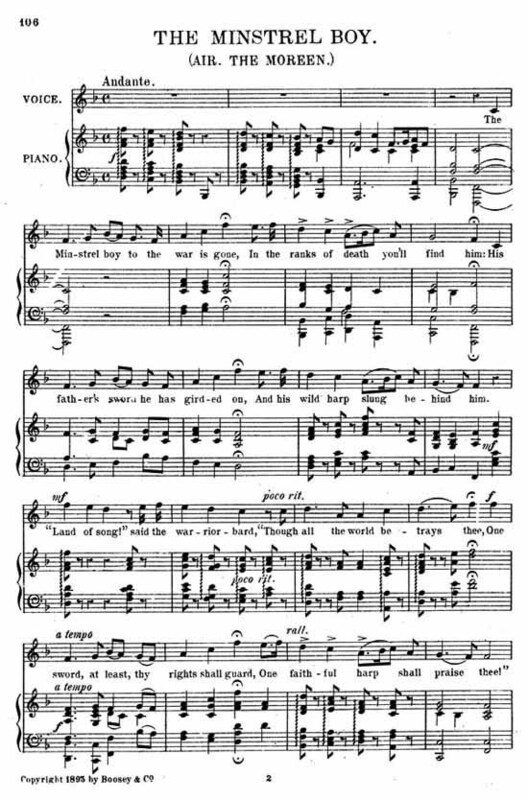 The Minstrel Boy is a stirring Irish war song commemorating the fallen and enshrining the virtues of loyalty and heroic sacrifice. The Irish bard, still a mere boy, takes up his father's sword and marches off to war to defend his homeland. Though he falls in battle, he dies heroically, in defiance of his enemy up until the very end. With this example, let us not fall into the middle-of-the-road error of lamenting his young life cut short. Instead, let us remember that it is better to die staying true to the Catholic cause rather than to live a long life in compromise and apostasy. The Minstrel Boy was composed by the Irish poet Thomas Moore (1779-1852) and set to the tune of the old Irish air: The Moreen. Since that time, is has spread wherever the Irish have gone, becoming popular in the United States military as well as the police and fire departments of major cities where the Irish settled. It is here performed by the Clancy Brothers and Tommy Makem.